It doesn’t need any introduction, as every Indian would have eaten this sweet flat-bread sometime in his/her life. With its numerous variations, puran poli is eaten across length and breadth of India and this recipe is for making one of most widely popular, sweet and savory, elaichi (cardamom) flavored pooran polis having delicious stuffing made of tuvar dal. The use of nutmeg powder, even though in very small amount, compliments the flavor of cardamom and jaggery making it even tastier. Follow the given step by step photo recipe to make it at home. Note: Read tips and variations given below to make Gujarati, Maharashtrian, Konkani and South Indian style puran polis. Wash tuvar dal in water for 2-3 times and soak it in water for 30 minutes. Drain excess water and pressure-cook it with 1½ cups water in a pressure cooker (3-5 liter capacity) for 3 whistles over medium flame. Let pressure inside cooker comes down naturally; open the lid and drain any excess water. 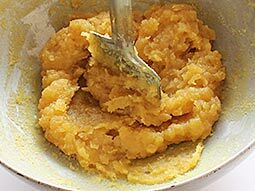 Gently mash the dal with backside of a spoon or masher. Heat a medium size heavy based pan or non-stick pan over medium flame. 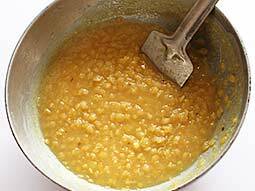 Add cooked dal, sugar or jaggery and ghee in it and mix well. Stir continuously and cook until mixture turns thick or for approx. 15-20 minutes. You can check the thickness of puran is appropriate or not by placing spatula vertically straight in the center. If it does not fall, then the mixture is thick enough otherwise stir and cook for 3-4 minutes more and check again. Add cardamom powder, nutmeg powder and mix well. Turn off the flame and let mixture cool at room temperature. Divide mixture into 6 equal portions. 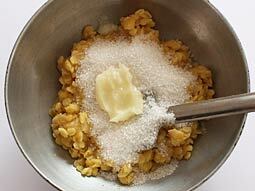 Take wheat flour in a medium size bowl and add oil. Now, add water as required and knead smooth dough (like paratha dough). Cover the dough and let it set at room temperature for 15 minutes. After 15 minutes, knead it again and divide it into 6 equal portions. Take one portion, give it a shape of ball and press a little. 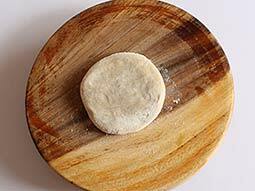 Coat it with dry flour and roll it out into a 4-5 inch diameter circle (like puri) using a rolling pin. 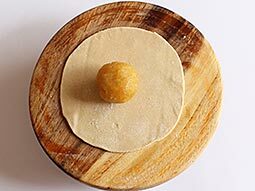 Place one puran (stuffing) portion in the center of rolled puri. Wrap stuffing with all sides of puri and seal top where all sides merge. 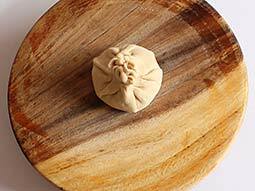 Pinch off excess dough and give it a round shape of ball. Press stuffed ball a bit and make thick pattie, coat it with dry flour. Roll it out using rolling pin into approx. 6-7 inch diameter circle. Heat a tawa over medium flame. When the tava is medium hot, place raw puran poli over it. Cook it until golden brown spots appear on the bottom side. Flip and cook another side until brown spots appear there as well. If required, repeat flip and cook process one more time to cook it evenly. Transfer it to a plate and spread as much ghee as you like on both sides. Repeat the same process for remaining dough and stuffing. 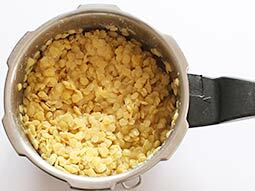 Do not cook tuvar dal with too much water otherwise stuffing will not turn thick easily. To roll them out easily, prepare the stuffing couple of hours in advance and place it in refrigerator. Refrigeration makes it little hard which in turn makes roll out process easier. Use milk instead of water for making dough. This will make soft outer layer. You can use rither chana dal (gram lentil) or tuvar dal to prepare stuffing. Use jaggery instead of sugar and chana dal or tuvar dal to prepare stuffing to make Maharashtrian style pooran poli. 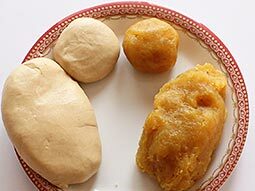 Obbattu or Holige is popular sweet dish in Karnataka and Tamilnadu. To make south Indian style puran poli, use gud (jaggery), grated coconut and chana dal or toor dal for stuffing and maida for outer layer. 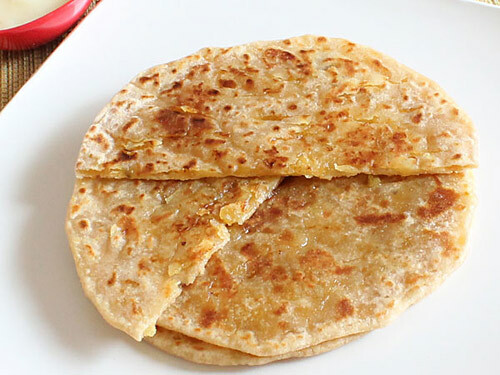 Prepare Gujarati style puran poli by making stuffing of just tuvar dal and sugar. Make Konkani style puran poli by preparing stuffing of grated coconut, chana dal and tuvar dal. 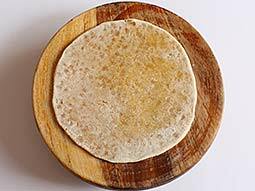 Serving Ideas: There are many ways in which this simple Indian sweet flatbread can be enjoyed. In different parts of India, it is served differently. However, the most common way of eating it is either on its own or with simple potato curry. Hello, I am tried this recipe and I got success, but my husband have diabetes so I want to ask that if I add sugar free instead of jaggery so then how much quantity of sugerfree pouch should I use in 1 katori chana dal. Please suggest me to make superfine puran poli. If you mail the answer then it will be more easy for me. Response: Thank you Sonal for the feedback. Sugarfree Splenda is very sweet. You may use 1 pouch for 1 katori chana dal. Taste it after mixing it and it turns out less sweet, add more. Response: Hello Lalita, follow the below given steps to make the hard puran soft. 1. Break the puran into small pieces. 2. Heat 1/2 cup water in a pan and bring it to a boil over medium flame. 3. Reduce flame to low and add pieces of broken puran into the water. 4. Stir continuously and cook until it is mixed well and you get the desired consistency of puran. 5. You can increase or decrease the amount of water according to the quantity of puran. First try with small 1/4 cup of water and less amount of puran. I hope this would help you. Happy to see step by step recipe, getting more confidence, thanks for your time. Awesome recipe.... keep adding more recipe like this.. Thanks to foodviva. Wow its quite intresting. Very good recipe. It's so easy. I tried many times. Thanks. I wish we could get a puran powder with lot less effort and same taste... what to say? Awesome recipe tried today. Came out yummy. Husband comment "please make this for my tiffin (lunch) too". 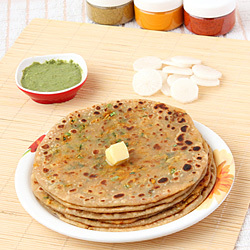 Hi, happy to know that we can make pooran poli with tuvar daal too. Thanks for sharing. I will try it..happy pongal. Response: Happy Pongal Meenakshi. In Gujarat, we make poli with toovar dal and it tastes delicious. After trying this at home please provide the feedback. Hi, I tried this recipe. The puran was awesome! 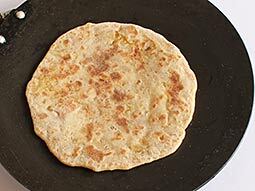 However the the puran poli didn’t turn out the way it is shown in the images. I mean the taste was awesome but not the appearance, because my poli broke into pieces. I think maida would be better instead of wheat flour. Response: Hi, I think something is wrong with the dough. Did you bind the soft dough? It is important to bind the soft dough to roll it out easily. Its a good reciepe..tried many times..
Hi I tried this good recipe of yours, came out good thank u so much.